Cargo shipping containers are the backbone of the international shipping industry. Made of steel and up to 40 feet long, they are as big as a house, and because of their size, they offer the construction industry an affordable option for a permanent or portable site structure that is totally customizable to fit the clients site needs. Pre-assembled at our workshop, Precision Service & Pumps can design the inside area of a C - Can to accomodate any pump system package. We fully assemble and install the total pump system within the C - Can enclosure prior to delivering it to the site. Once the C - Can is delivered to the site, we connect it to the existing system. Any electrical hookups or any sized diameter pipe penetration can be flashed to the C - Can and sealed with ease. Each C - Can is pre-engineered and totally customized inside and out to meet the client's specifications at our prefabrication shop. 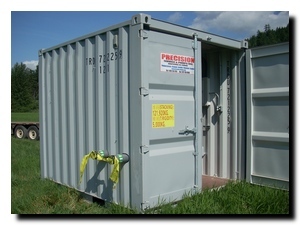 Once the C - Can is fitted with all of the inner workings to meet the job it is designed to perform, the container is shipped from our shop to the clients site were we connect it to the site infrastructure and complete the initial startup and commissioning. From shop-built to site installation, our stringent quality control system and attention to detail ensures the consistent delivery of a strong and dependable product package designed to meet your specific job requirements. At Precision Service & Pumps Inc quality and workmanship are results we take pride in delivering with every C - Can we customize. This is why every Precision Turn-Key C - Can undergoes extensive quality control checks before it's released for shipment to the clients site and then installed by our certified installers.